How is Winter treating you? News Flash showed it's snowing in some parts of India and the places are attracting lot of tourists. However, most of the parents of school going kids are busy with their kids on-going exam, can't enjoy vacation at this moment. This year winter is consistent in Bangalore it's not too hot or too cold within a short period of time. We are taking the fun of Winter days with varieties of food prepared from winter goodies. Apart from peas, carrots and other fresh vegetables, winter also gives us baby potatoes and potatoes. Potatoes are grown during winter months and later stored in the cold storage as the stock for the whole year. While baby potatoes are available during this time of the year. I remember my maternal grandmother was fond of these baby potatoes and she used to prepare stir fry with these baby potatoes. In Bengali, we call 'kucho aloo' to these baby potatoes. Normally when dida used to make the stir fry she never used to peel the potatoes. There are two-three reasons behind this. First of all she used to prepare in a big batch so peeling was avoid to save time. Secondly, new potatoes have very thin skin and difficulty in peeling. If you peel the potatoes and over cook them, stir fry will be mushy. Lastly, stir fried baby potatoes were paired with a cup of hot tea in the evening. While peeling and eating is a kind of fun and time pass with all your family members. Even if you don't peel and chew the peel you can get the mild sweetness which gives a different flavour and can take out the remaining part. These baby potatoes are good for aloo dum too. Normally, I prepare Aloo Dum or baby potato stir fry using baby potatoes. 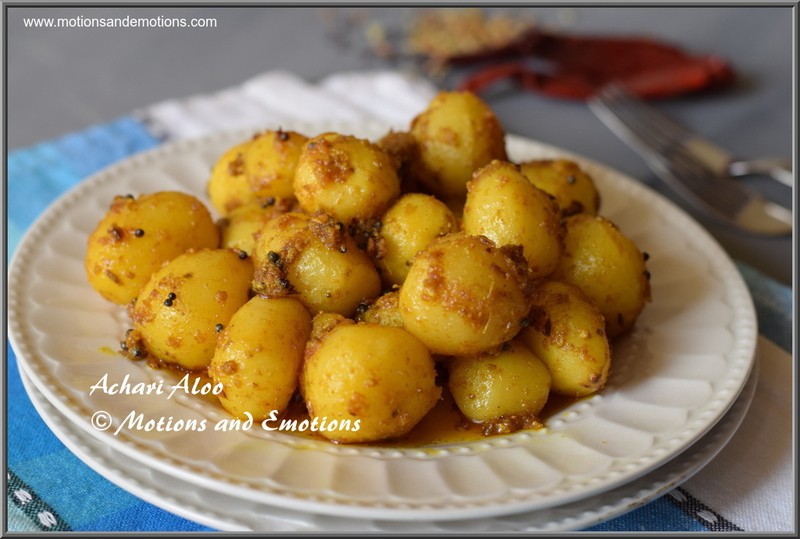 This time I tried making achari aloo which also an easy and tasty dish. Achari aloo goes very well with roti, naan or paratha. I have not used onion or garlic here. However, if you want can use onion to make thicker gravy. You can also make achari aloo as a vegetarian starter and people will enjoy it. This is a good recipe for kitty parties or kids parties. In Northern part of India, people prepare pickles with winter vegetables and enjoy through out the year. Earlier winter vegetables were only available during winters and excess produce of winter vegetables were converted to pickle or achar and relished for the remaining year. However, advanced techniques in Agriculture has changed the scenario and we get all the vegetable through out the year. But Winter produces taste best at their own season. People still follow the tradition of making achar. So I thought why not give these baby potatoes an achari make over. I used all types of spices including fennel, fenugreek, nigella, mustard, cumin,used for the preparation of pickle to give the aroma and the taste of the pickle. You should use mustard oil to cook this dish as the main ingredient of pickle is mustard oil. The oil content of this dish is bit excess otherwise it won't taste like an achar. I have used dry mango powder and curd for the tanginess of the pickle. Achari aloo is a dish which has the right balance of sweet, sour and spice just like the pickle. 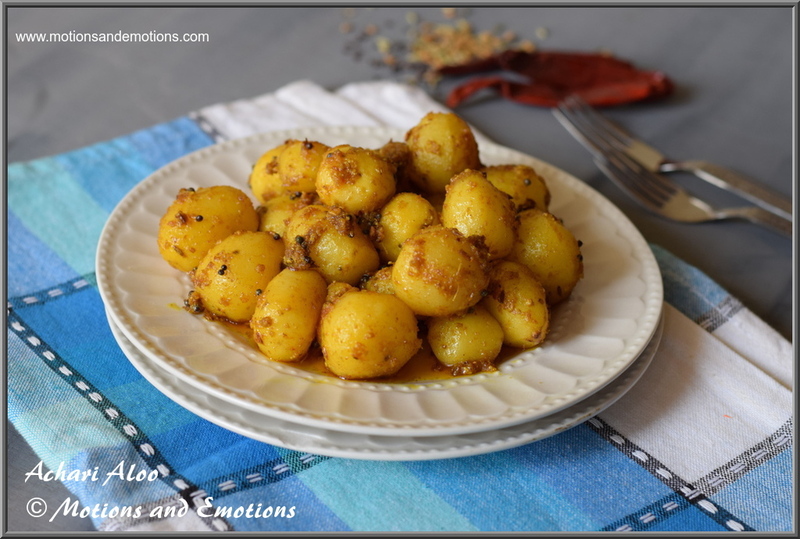 This is a very easy and tasty dish and learn here how to make achari aloo or achari alu. 1. Wash the potatoes and peel them. Later put them in pressure cooker and allow 1 to 2 whistles. 2. Once the pressure releases, drain the water. 3. Now heat oil in a pan and fry the boiled potatoes with turmeric powder and salt. Take them out and keep aside. 4. In the same oil add a pinch of asafoetida (hing) followed by dry red chilli, cumin seeds, nigella seeds and mustard seeds. 5. Once they started spattering, add ginger paste and fenugreek seeds powder, fennel seeds powder, turmeric powder. Mix them well and add fried potatoes. 6. Next add red chilli powder, dry mango powder, chopped green chilli and coriander powder. 7. Once the masalas are well cooked, beat the curd adding garam masala powder and add into the pan. 8. Cover the pan and reduce the flame. 9. Adjust the salt and when gravy becomes dry you can switch off gas and garnish with fresh coriander leaves. Delcious and flavorful achari aloo..
Good memories of schooling days will always be treasured. But I like to move on and treasure other things as well. Ahhh!!! nice potato dish. I love achaari aaloo, but I hate peeling baby potatoes, do you have any trick to reduce the time. This is the best travel food along with some pooris. This looks delicious and is my all time favourite. Baby potatoes definitely taste so different from the normal ones. Love the number of spices you've used to make a chatpata achari aloo. My daughter love achari aloo, a perfect dish to carry while travelling. Flavourful, great with pooris. Love this achari aloo, it's so flavoursome. Pairs well with some roti.